So ummm, everyone, I was nominated for another award!!! Isn't that crazy?! I know my blog is still small. I'm amazed that people liked it enough to think of nominating it! 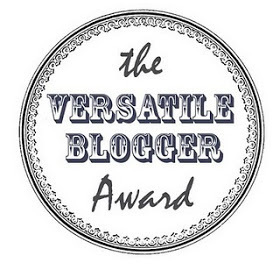 Thank you Courtney from Courtney's Little Things for nominating me for the Versatile Blogger Award! And seriously, if y'all are like me and cant keep track of your thoughts and ideas, y'all need to check out her blog. She has so many ideas, organizational tips and quick easy DIY that will help make your day run smoother. No joke, she is the reason I started using a planner. Now back to the award. As always, Thank the person(s) who nominated you. Nominate fifteen bloggers (or so) to pass the award along to. 1. I'm a Tutor?- Although I help my mom throughout the day at our new business, from 4:45pm through 7pm I tutor an 11 yr old. Which is kind of difficult because I barely remember what I learned in my last year of college. I am deeply thankful for Google and other online resources. Besides I am not getting paid so it's not like it matters- right?----hahaha, just kidding--I try my best. 2. I didn't learn English until I was in 1st Grade-Spanish is my first language, and although I was born and raised in Texas, I only knew a couple of words. It wasn't until 1st grade that I was actually pushed to learn, because I was falling behind in class. 3. I can be very sarcastic- Around my side of town, I'm known for my sarcasm. Although I try not to be sarcastic with someone until I get to know them. I would like to try and avoid any awkwardness because someone new thinks I have offended them. So if I start making sarcastic comments around you that means I'm beginning to feel comfortable. 4. I admire Respect- I dont need everyone to agree with me, as I do not need to agree with everyone. However, I feel like we all should respect each other. When I see people of opposing views, being able to communicate with respect, I completely admire that. 5.I love opposing views- This goes with my previous fact. I love seeing opposing views on a subject. I have friends who think so differently from one another on pretty much every topic. I enjoy reading and learning from their arguments. However it can be extremely stressful the respect is lost. 6. I'm terrible with lyrics- When I make my lyrics cards (pictures with lyrics) I have to listen to the songs several times. Those things are hard work. If you ever see of them incorrect make sure to tell me, I won't mind. 7. I'm a soccer person- Although I'm terrible at sports, I enjoy watching Soccer/Futbol. I think it's because when I was small it was one of the things that my dad and I would get to enjoy together.I don't keep up with it as much as I would like. Now when the World Cup comes along I'm always watching along with my dad, and my siblings have also joined us, it has become a family thing. Alright. Now it is my turn to nominate a couple of amazing blogs. Make sure to check out these amazing blogs! They are all very different and have exciting things to share, and I just realized most of them are also from Texas. Hopefully, my facts give you a bit more insight on who I am. Do we share some of these facts? or anything completely opposite? Let me know, I want to get to know you as well. You are one amazing individual! Love you, Vianca!!! Loved learning more about you! I always like hearing different views on topics, but it's really hard because like you said you have to be respectful while doing so. I have to be with the right people to bring up those conversations. I'm right there with you on the opposing views. No matter what I think I stand for, I always end up weighing both sides of an issue. It can even be annoying at times! Yes! I'm glad I am not the only, I feel like being able to listen to both sides is important. You don't have to change your mind, just listen respectfully.Lets learn from each other. Too cool. I love your answers!